Social networking is here to stay, and it’s the perfect way to make sure your business contacts are as helpful as possible in finding you a job abroad. Although there are still plenty of people that find a job using the more traditional method of registering with a recruitment consultancy, having your CV sent out to companies and then having a series of interviews, with the economic downturn seeing us cling on to our jobs and companies keen to save on agency fees, any new ways to find employment need to be grabbed with both hands. It’s the same principle whether you’re looking for work at home in the UK or abroad – make sure you use whatever possible advantages you have! 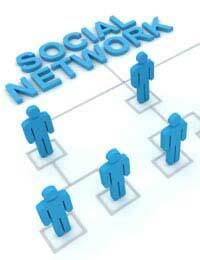 So utilising your social networking contacts and possibilities makes practical sense. But how do you use your social network without looking like a desperado? Follow these tips and you should avoid it! It’s easy to get a network of old colleagues and people you went to school and university with, and that may be fine if you happened to go to a very prestigious university with people that are now the movers and shakers in your industry, but for most of us, we have to think outside the box a little. While it’s all well and good to contact old colleagues (and you really must – you never know who’s going to get a promotion and be doing the hiring and firing) the real trick to building a social network of contacts is to keep in touch with people that can say yes – often called the ‘decision makers’. So, clients you’ve worked with that were impressed with you, people you’ve come into contact with at business functions and other relevant people that you have met. With websites like LinkedIn, it’s easy to ask someone to be in your network as there is a standard email that is sent as a request. Although some people like to add a little extra note into the email, it really is unnecessary. It is quite common practice now for a person to send a LinkedIn request after a meeting, so don’t be afraid to do so – better within 24 hours of your meeting rather than much later. To keep your network strong and to make sure that you are in people’s thoughts if suitable positions abroad are available, it is a good idea to make regular updates to your status. This certainly does not mean foolish updates on Facebook every five minutes (and it’s best not to have any business contacts on your Facebook at all – leave that for your private life friends only) but rather making relevant comments on Twitter or LinkedIn that show you are up to date with your industry, and even that you are looking for work - said in a positive manner, of course! You can set your LinkedIn profile to use your tweets or Facebook updates as your status there too, so be careful what you say if you have very different people in each network! A positive aspect of LinkedIn and other social networking sites geared up for professionals is that you can ask for referrals from people in your network. These are like short, snappy references that are written by your contact (only if you ask for it – there’s a template email for this on the site too) and are then visible online for anyone that searches for your profile. Don’t be afraid to ask – people love to help and if you’ve done a good job, they will be only too pleased to write a referral.